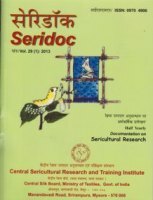 SERIDOC - A half yearly documentation on sericulture research references in bibliography level is being published by CSRTI, Mysore since 1985. It is a half yearly journal, published in April and October. Seridoc issues are available on Web from 2017 onwards. Click on the volume number to view/download the same. Current issue is Vol.33(2):2017. Previous issue is Vol.33(1):2017. Seridoc old issues are available for sale @ .100/-per year (i.e. Two issues) from 2005 onwards. Cost towards purchasing old issue of Seridoc should be paid through Bank Demand Draft drawn in favour of Director, CSRTI, Mysore and payable at Mysore.